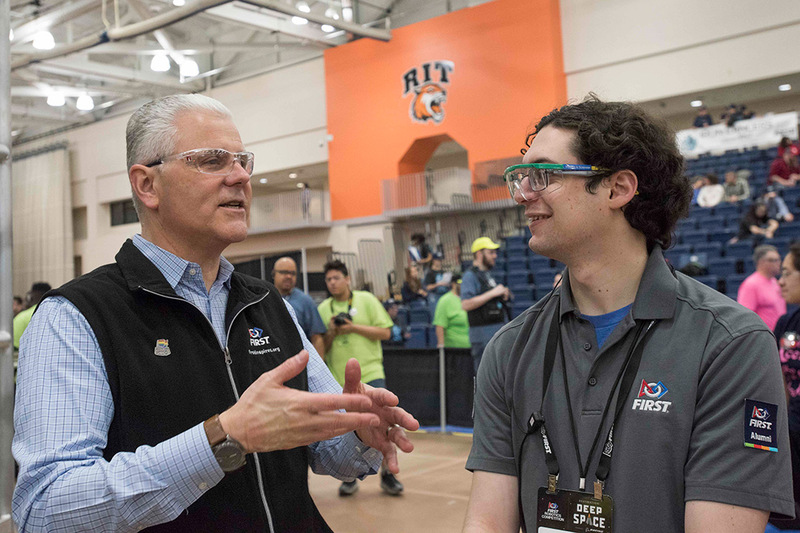 Dan Schneiderman, right, talks to FIRST Robotics President Don Bossi prior to matches in RIT’s Field House. Schneiderman and Joe Kessler, both RIT alumni, were named Finger Lakes Regional Volunteers of the Year. RIT alumni and long-time supporters of FIRST Robotics, Dan Schneiderman and Joe Kessler, were recognized as the 2019 Regional as Volunteers of the Year during the FIRST Robotics Finger Lakes Regional competition which took place March 15 and 16 at RIT’s Gordon Field House. Both were honored for their contributions to the organization and the regional competition, serving in a variety of roles from advocates and team mentors to field judging, set up and match coordination. Schneiderman was a teenager when he participated with the Rush Henrietta High School robotics team in a FIRST Robotics Finger Lakes Regional. He’d remain connected to FIRST Robotics as well as become involved in the youth robotics and Maker Community teams in the area. “I’ve been involved with FIRST for 14 years, originally as a student, then as a mentor and now as a volunteer for the past 12 years. FIRST is more than just robots. It’s a greater community that encourages us to work together, continuously learn and face new challenges. It is the community that keeps me involved and wanting to provide opportunities for future generations. I find it hard not to be inspired by the students, mentors and volunteers—in and out of the competition,” said Schneiderman, who is an outreach specialist with RIT’s K-12 University Center. Since 2017, he and Danielle Gramlich co-coordinate the 100-plus volunteers needed to manage one of the largest FIRST regional events in the country. A. Sue Weisler Student competitors test and tweak their robots for the FIRST Robotics Regional. The REBEL Robotics team from Great Neck, N.Y., would go on to win the prestigious Chairman’s Award and qualify for the national championship with local favorites Spencerport, Churchville-Chili and Midlakes/Canandaigua Academy High Schools. Kessler has been involved with FIRST since 1999, serving as a mentor for four different area FIRST Robotics Competition teams and one FIRST Tech Challenge team. He has supported the Finger Lakes Regional since its inception and has played a role in event setup and field reset. He is newly retired, after having worked for more than 33 years for Kodak and Harris Corp. in Rochester. 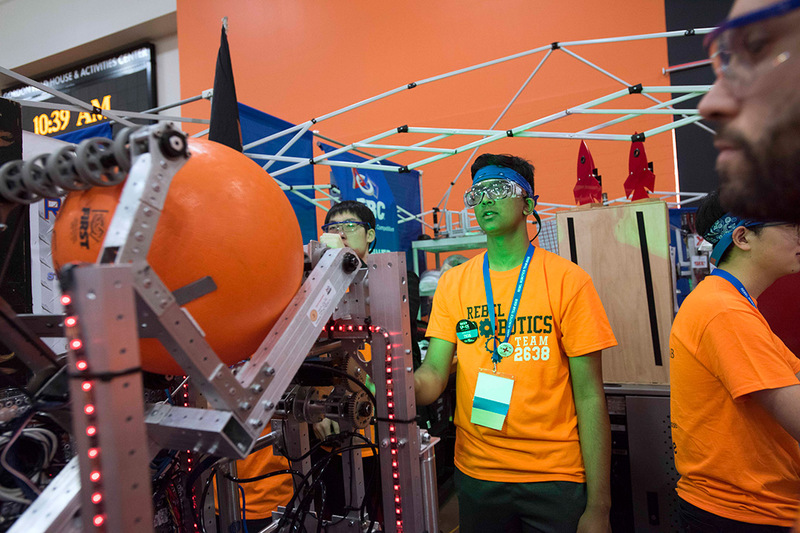 This year, 48 teams from across New York, Ohio, Michigan and Pennsylvania as well as Canada, Mexico and China competed in the regional that has taken place at RIT for 15 years. At the inaugural FIRST Robotics competition in 2005, there were 16 teams representing the Upstate New York area. In 2019, 31 teams from the area competed, said Glen Pearson, the Finger Lakes Regional director. “Having a regional in the area allows the students to participate without the added expenses of travel. It also gives those schools and districts without a team, as well as companies not yet involved with FIRST Robotics, a chance to experience the impact being part of FIRST has on students. These students, in a few short years, will be the technical workforce our local companies need to grow and prosper,” said Pearson, who will be retiring this year as director, but intends to remain involved in the FIRST Robotics community. Winners of the this year’s regional are: Team R.I.C.E (Team 870, Southold Jr. & Sr. High School from Southold, N.Y.); Ranger Robotics (Team 3015, Rochester’s Spencerport High School); and the Mechanical Marauders (Team 271, Bayshore Senior High School, Bayshore, N.Y.) These teams will be joined at the FIRST Robotics National championship in Detroit April 24-27 by runners up Team 340 – Greater Rochester Robotics (Churchville Chili HS); Team 3003 – TanX (Midlakes HS and Canandaigua Academy, Canandaigua, NY); Team 120 – Cleveland’s Team (Youth Technology Academy, Cleveland, OH) as well as The Chairman’s Award winners REBEL Robotics (Team 2638 from Great Neck, N.Y.). This award is one of the most prestigious awards given at FIRST and presented to the team that best embodies FIRST principles and is a model for other teams to emulate. All individual and team awards can be found online.